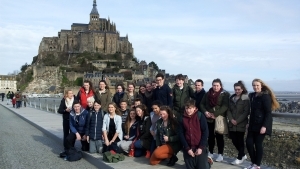 Our French Exchange with the Lycée Victor Hugo in Château-Gontier in the north west of France continues to thrive from year to year. Connections and relationships with the French school, their management, staff, parents and students have gone from strength to strength over the years and we are thrilled that this exchange offers our students such a rich linguistic and cultural experience. Every year, in October, we welcome the French teachers and their students for a ten day period. During their stay the students attend classes spanning the range of subjects on offer in the school. They are also treated to trips to places of cultural and educational interest, such as Glendalough, Croke Park, the Dunbrody Famine Experience, Kilkenny Castle, Trinity College, Kilmainham Gaol and Dublin City. A cultural evening of traditional music and dance is also facilitated by the school folk group, trad band and musicians. The French visitors are invited to observe and then to participate in the music and dancing, which always proves to be a big hit! re hunts in Château-Gontier, breathtaking castles and bustling cities as well as the cafés, music, croissants, art, culture, and everything else that forms the beating heart of French life. The exchange involves an action-packed ten days, both at home and abroad. It is of invaluable importance to our language students. They share their culture and life with their correspondents and in return they experience first hand the culture that they have previously been studying and reading about in the classroom. The language comes to life for them as they are immersed in the culture out of which the language itself is born. 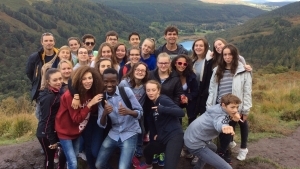 On return, their classroom experience is improved forever, as they can make connections and relate back to the real life experiences they encountered in France. We strongly encourage our 2nd year students to apply each year. Students participate when they are in 3rdyear.